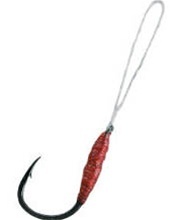 Easily attaches to any hook or lure. Great for spinnerbaits, buzz baits, jerkbaits and jigging spoons. Size 8 and 4 use 30 lb. braded line, size 1 - 2/0 have a 50 lb. loop.